send rooming list at least 8 days before arrival. 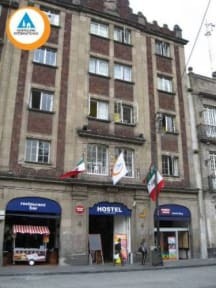 We are the most VISITED, most REVIEWED and most HAPPENING hostel in Mexico City. With an unbeatable location (trust us), the best hostel bar in town (with amazing views and backpacker prices) and professional quality standards, we are proud to be the leader and trend-setter in the hostel industry in the city. Our aim is to provide the best option for travelers looking to meet other travelers, experience the city with our off-the-tourist-path free walking tours and our famous activities, all of these while enjoying your stay in a beautiful building with top notch security and facilities. 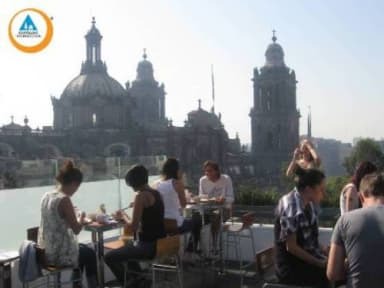 LOCATION: right in the zócalo, between 2 metro stations (both less than a 3 min walk) and amazing view of the Cathedral and Zocalo. FUN: We organize daily free activities: BBQ, Guacamole, Salsa and Tequila Night. Free walking tours to the markets, pulquerías and interesting neighbourhoods. COMFORT: all our dorm beds come with a reading lamp and electric outlet (we know you want to charge your phone/computer). We provide fresh clean sheets on arrival. Our showers have 24/7 hot water and we provide shampoo/body wash. All rooms have wooden floors and all the private rooms have a flatscreen TV. BREAKFAST: our free hot buffet breakfast will fill you up both with Mexican dishes and the classic European fare. BAR: Travelers from all over the world meet every night at the Barpack, our world famous bar. SECURITY: We use electronic key cards plus have a security guard and reception open 24/7 and we are located in the most secure area of downtown. FACILITIES: free Wifi, computers, TV room, DVDs, kitchen, laundry, book exchange, bar, smoking terrace and travel agency. Staff were multi lingual and very helpful. The location could not be better. Walking distance to the Metro, museums, etc. I found my stay at Hostal Mundo Joven to be very good, though I am not young. The staff was friendly, outgoing, and helpful. Their breakfasts are very good and well organized, and it has a social atmosphere, which I appreciated. One couldn't ask for a more perfect location. The only not great thing about the hostel was that the showers were only tepid- but that may be fixed pronto. Since the bathroom and shower were private and attached to the dorm room- it was another plus. This place has a GREAT location. Behind the big church at the Zocalo. Staff are nice and it’s safe. Small rooftop view by kitchen. I believe they also have a rooftop bar which I didn’t have a chance to check out. I stayed on the fifth floor, right below the rooftop bar and near the kitchen area. It was a bit loud after 10pm, it’s a younger crowd so it’s not surprising. The place has lots of rooms/beds, it feels a bit like a hotel. A near by toilet must have been busted, the fan helped a lot. Nice hostel, with a great location. Dorms are okay, bunk beds a little flimsy (like many places), breakfast isn't great, but the rooftop bar and balcony areas are excellent, with the views making it all worthwhile. The area is very safe, and well patrolled at night around the area. I would recommend for your budget backpacker. Not a hostel vibe in the slightest. More like a hotel. But not in a good way. Staff were not overly friendly. Didn’t really give me much info. The roof top bar is open to public so there’s a weird vibe going on. It’s like a normal bar in the street with all the locals. Not good for a solo travellers. Didn’t meet anyone. Nice clean beds tho. And slept great. Breakfast is decent too. I just wouldn’t rush back. In overall the hostel was not clean, bathrooms had a bad smell, poor showers, and is also under construction, the only good thing about the hostel is the location near the zócalo. It has a very nice rooftop thought, not a hostel vibe. No social atmosphere due to lack of spaces. The front was under construction and the rooftop catered to a more upscale, local clientele. My experience in this hostel was awful— there was a remodel going on that was very noisy and left a toxic smell in the air throughout the night. The hallways were very loud and echoed the party music upstairs and hallway conversations all night. Although the staff is punctual about closing the bar at a reasonable time, they seem hesitant to remove noisy groups in the late hours of the night. I expected more given the rating and price. I don’t understand why this hostel is rated so highly. It’s just a weird club with some rooms beneath there is no atmosphere. have to share an entrance with the club which is annoying. the music is so so loud and i like to party but it’s not what you want when you’re in bed! The facilities aren’t good, the shower was freezing cold with loads of exposed electrics. The only good thing was the lovely man on reception who really helped me out when I was having trouble with a taxi, thank u so much!